Lunt proudly presents the 24th limited edition of their annual Snowflake Series. Hand cast in sterling silver, this snowflake sparkles in holiday splendor, but, unlike fragile snowflakes that fade when the sun appears, this unique collection of ornaments will grow even more beautiful with every passing year. If by some small chance your item is not satisfactory, your return should still be received within 7 days or less. Be sure to check my other listings for more great Reed & Barton ornaments and crosses and other fine Christmas ornaments, collectibles, Victoriana, elegant glassware and more!!! Your store for more Christmas! It may be in the "To Be Listed" inventory. 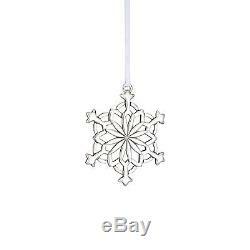 The item "NEW 2012 Lunt 24th Annual Sterling Silver Snowflake Ornament Pendant Medallion" is in sale since Wednesday, July 11, 2012. This item is in the category "Collectibles\Holiday & Seasonal\Christmas\ Modern (1946-90)\Ornaments\Metal".